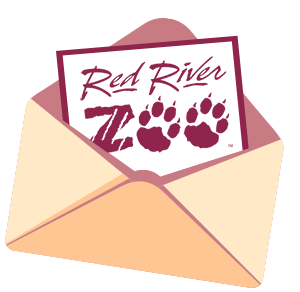 Physical Red River Zoo gift cards can be purchased at the Zoo admission counter. The Zoo admission counter is open daily from 10 to 5, even during our winter operating schedule. eGift Cards can be purchased online and redeemed anywhere throughout the Zoo. Memberships make a great gift for people to enjoy all year long! We can mail the membership to you OR the recipient. Purchase or renew a gift membership through April 20th, and you can either receive $5 off OR the recipient can receive a free carousel punch card!